Similar as other smartphones, iPhone allows its users to surf the Internet on the built-in browser Safari, and Safari also stores users’ browsing history. 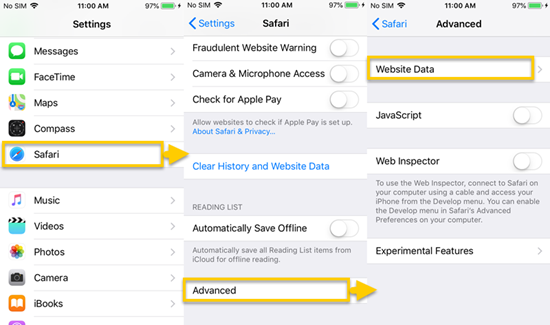 It’s very easy to delete or clear all history on iPhone, just by tapping the clear button on the top of the bookmark page in Safari. But how to check history on iPhone after it’s been deleted? Just read the following to retrieve the deleted iPhone browsing history. If the Safari history was cleared within 30 days, and you’ve enabled iCloud auto syncing of Safari bookmarks (see if you previously toggled on Safari in iPhone Settings > [Your Name] > iCloud), you can first check it on the iCloud.com with your Apple ID. Sign into iCloud.com and click on “Settings”. 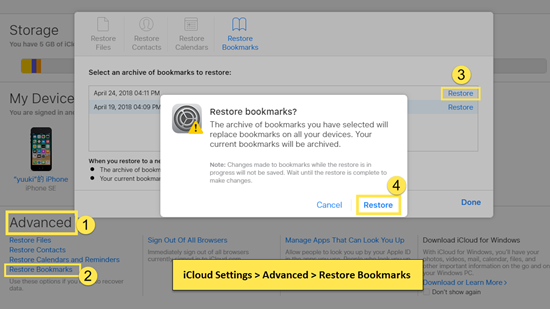 Scroll down to “Advanced” and click on “Restore Bookmarks”. Choose the latest archive from the list to restore. If you can’t restore the deleted browsing history from here or just get the prompt “No Archive Available”, then skip to the next ones. 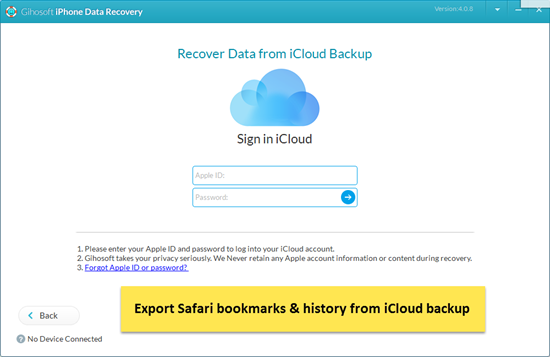 If you get nothing from the iCloud.com, you still can recover deleted Safari history from iPhone or iPad directly for free, and all you need is the powerful software Gihosoft iPhone Data Recovery, which also can help you recover deleted iPhone messages, contacts, etc. Step 1: Install and run this iPhone Safari history recovery tool on computer, and tick on “Safari Bookmark”. Step 3: Preview the deleted items and recover the browsing history from iPhone or iPad. 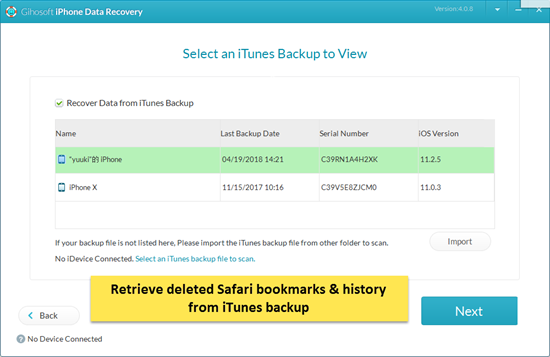 If you have a habit of regular backup, then you can retrieve the deleted Safari bookmarks and browing history from iTunes or iCloud backup. Since both of them are encrypted even for users, you can either choose to restore the whole iPhone from backup (probably lose all the current data), or use the Gihosoft iPhone Data Recovery software to extract the specific data for free with these steps. 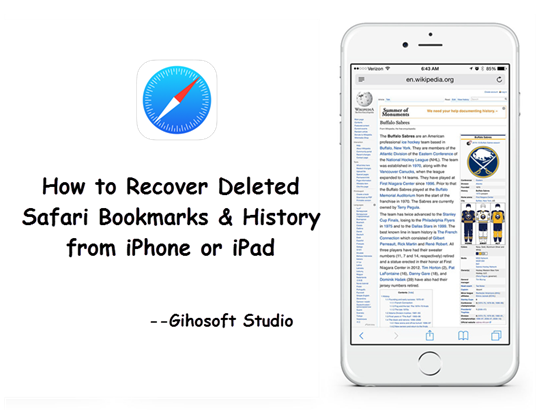 Step 1: Run the iPhone Safari Recovery tool and select “Safari Bookmark”. Step 2: Click “View iTunes Backup” and scan the backup file. Step 3: Preview and then retrieve the deleted safari bookmarks as well as history from iTunes backup. If you want to restore iPhone with iTunes backup, just connect your device to computer, run iTunes and click on ‘Restore from Backup…’ in the menu File > Devices and choose the latest backup. 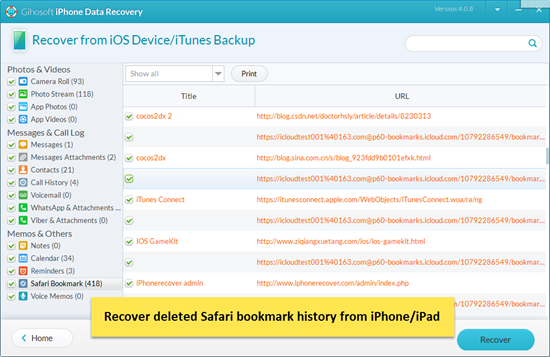 Step 1: Launch Gihosoft iPhone Data Recovery and check on ‘Safari Bookmark’. Step 2: Click on “View iCloud Backup” and sign in iCloud. Step 3: Select the latest backup to download and scan. Step 4: Preview the scanned result and export the safari history from iCloud. If you want to restore the whole iPhone from iCloud, just factory reset your device by clicking ‘Erase All Content and Settings’ in Settings > General > Reset, and choose ‘Restore from iCloud Backup’ in the later setup page on iPhone. Also, you can check the domain name of the deleted browsing history on iPhone or iPad directly. Last you will get a list of visited website domain names.